Mr. Cracker is a thirtysomething presumed male Ruby macaw who came to us two months ago when his parront was rushed to the hospital in critical condition. Cracker had lived with this person for nearly twenty-five years. When we brought him home he cried for two days. And then he pretty much shut up. It took him about six weeks to decide he wasn't going to starve to death after all, and stopped literally inhaling all the food we put in his food dish. He would even eat lettuce leaves. We've never known a parrot to eat lettuce! When Cracker came to us he had been subsisting on a diet of sunflower seeds and peanuts. We have no idea how long this condition existed, but Cracker was probably literally starving to death! Cracker was the parrot's original name, but the previous parront renamed him Alexander, because he felt the name Cracker was undignified for a parrot. Even though he does say Alexander, Cracker immediately let us know that he prefers the name Cracker. It may be stupid, but it's still his name. Except for letting us know virtually right away that he preferred the name Cracker, as we mentioned, Mr. Cracker pretty much shut up for about six weeks. This seems to have coincided with the time he still thought he might starve. But over the past two weeks he has started talking, singing, and dancing up a storm! For a summary of his original vocabulary, please refer to our previous blog post introducing Alexander/Cracker. Now we can barely keep up with the words and phrases we hear from him daily. He carries on a regular conversation that is still too garbled to us to understand. But besides his previous and current names, he says Come here, Food, Eat your food, What, What you doing, Parrot, I'm a parrot, Good bird, Bad bird, Hello, and Hello there. Recently, when we get ready to head out the door in the morning to go to work, he has started saying Bye Bye! He knows what Give a kiss means, and he freely blows air kisses. Needless to say, we're keeping our fingers crossed! Our next step to to address Cracker's socialization. Mr. Cracker still won't less us touch or handle him, but we are told his previous parront was able to step him up on his arm whenever he wasn't on his cage. 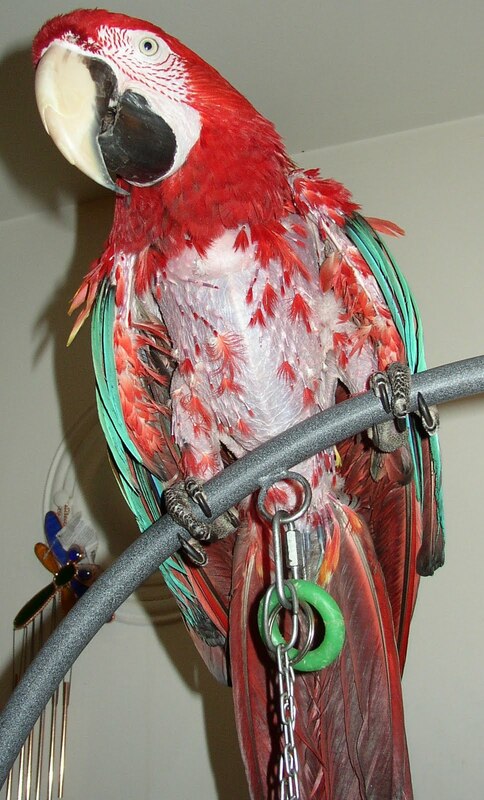 Mr. Cracker is still in need of a permanent Seattle area home, with someone who has macaw experience, and preferably already has macaws in their home. 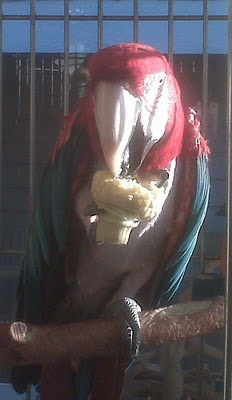 We think Mr. Cracker will do best living with other macaws. For more information about adopting Mr. Cracker, and other parrots in need of good new homes, please visit Northwest Parrots Fund.